Photocopiers are an essential part of any office, and it is important that every member of staff knows how to use the machine’s functions in order for the business to run efficiently. Modern photocopiers are now multi-functional, offering the ability to print, scan, photocopy and fax, all in one device. Typically, the functions remain the same across the same brand of photocopier, so if you have more than one photocopier in your business and they are the same brand, such as Ricoh, then once you know how to use the functions on one device, you will be able to use the other photocopiers effortlessly. 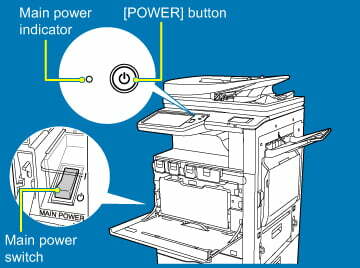 Locate the power button on your photocopier (usually on the front or side) and make sure it is turned on. Many of today’s devices are Energy Star rated so will have a power-saving mode and a button you can press to activate ‘sleep mode’. If yours has a sleep mode button, then press this button to wake it from its sleep. Many photocopiers require a few minutes to warm up. In general, the smaller and newer the device, the quicker the warm up time. Large devices which have multiple components and advanced features will take much longer to warm up than a desktop printer. Additionally, old devices tend to have slower warm up times. 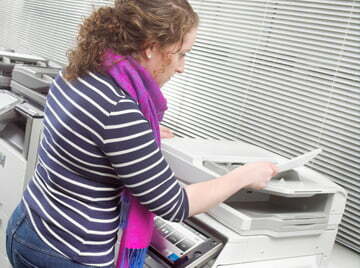 There are two methods of scanning on a photocopier: using the glass platen or using a document feeder. a. To scan or copy your document without a document feeder, open the lid and place your paper on the glass screen. Make sure you align the corners with the on-screen guides to ensure that the copy is straight. Close the lid, making sure that the paper doesn’t move. b. If you are wanting to photocopy documents with multiple pages, you may want to invest in a photocopier with a document feeder. Simply place your documents face-up in the document feeder. On the control panel you can choose whether to scan or copy. To scan, you need to make sure that the photocopier is networked, as your scans will need to go to your email or to a folder on you server. To photocopy, you can choose how many copies you want, the size of paper you want and whether you want to print on one side or duplex. The photocopier will scan the document and memorise it, before creating your perfect copies, to the resolution and settings you desire. Photocopiers are now able to print documents, which extends their appeal to businesses further. You will need to download the relevant print driver for the photocopier before you can print to the device. Each print driver is different, but from there you will be able to select the thickness and size of paper you want to print on, whether you want to print in black and white, if you want to print duplex (double sided) or simplex (single sided) and how many copies of the document you want. You can even tell the photocopier which tray to take the paper from on the print driver, useful if you use a lot of company letterheads and you wish to have a tray dedicated just for them. As part of Midshire’s Managed Print Service, we offer training on every device we install at a customer’s premises. Training can be provided for every employee so that they all know how to use the photocopier. The multifunction devices we supply have a whole host of different features and settings, some designed for general everyday use, other advanced features are more bespoke and aimed towards particular industries and commercial use. To help us give you the best and most precise training we can, Midshire will discuss your needs prior to installation and you to complete a training form, outlining which aspects of the device they want to be trained on.